Here are a few updated pictures of the nursery. but...I was able to get her pictures up on the wall, just in time for our little bundle's blessing day! I just LOVE this space!! The Robins egg blue walls are so soothing and inviting!!! Once again, you have created a Heavenly space on this Earth, Heidi. I love to come here and be inspired. Thank you! Just when I thought your nursery couldn't get any better! Still one of my favs that I've seen.... And trust me, I've seen A LOT! what a fabulously chic and adorable nursery. honestly. i am drooling over it. gorgeous! Swoon! It's absolutely dreamy! Do tell us again the name of that awesome paint color. Love this space. You did a fabulous job! So awesome! What is the paint color? I would love to paint our office or laundry in something similar. It's perfect! I would expect nothing less from your uber-talented self! 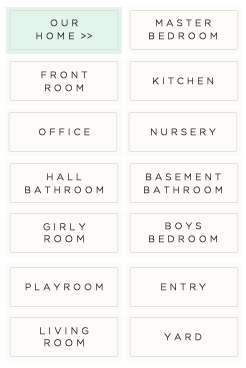 Your nursery is what I vision for my little girls nursery...that is if we ever have a little girl! It's beautiful! And I too would love to know the name of that awesome paint color. Oh my gosh.. This is my perfect nursey. I love it so much. I have seen a lot of cute ones before but this is just perfectly beautiful. I SO hope I have a girl one day. I am bookmarking this post to refer back to when I have a child one day. THANK YOU for sharing! LOVE LOVE LOVE IT! I love this nursery! I'd love to know the name of the paint color, also- it's gorgeous! I love your nursery! I would love to know the name of the paint color- it's gorgeous! You have the exact rug I am wanting to purchase for Caroline's nursery! I have to ask though, have you had any issues with a funky smell coming from your PBK rug? I have read a ton of reviews on their wool tufted rugs and 90% of them were horrible but none were recent. I'd love input from someone who I know has bought one recently! Beautiful nursery! I didn't notice a smell! The rug came perfect, I did buy it in the store so I'm not sure if that made the difference?? I've loved all my PB rugs so I'm not sure why you read such bad reviews? Good luck with the room, I'd love to see pictures!!! I was searching through nursery after nursery and found yours! I LOVE it! I love the blue and the purple combo-so Pretty! What color of blue did you use on the walls? I would also love to know the name of the paint color! I'm doing the blue/turquoise color in my two girls rooms and am having a tough time deciding. I would also love to know the name of the paint color. I'm going to do the blue/turquoise in my two girls rooms and I can't quite decide. Thanks! Would also love to know the paint color. My 12yo loves this room! I love those room! Can I ask where you got the frames? 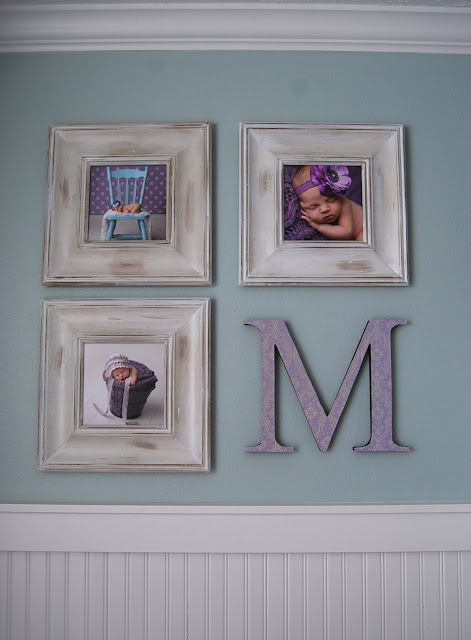 Hi Sara, the frames were made from crown molding! My cabinet guy built them for me, and then I painted them! Man another project. Is that just a stain? I spray painted them white then used Bri-wax over them! You could also used a glaze or stain! I love this room. Can I ask where you got the frames? Beautiful! Where did you get your chair at? Heidi I went to sherwin williams and the color that they showed me looked more grey than it did Robins egg blue. Thank you. Also I was wondering were you got you curtins from. I love the carpet, where did you get it from? We are expecting a baby girl in Nov. and I absolutely adore this nursery. Can you share where you got the bedding or fabric for the bedding? The colors are not your normal pink and green like most girl's nurseries and I LOVE IT!! Just checking...did you make the frames. Hi! What size are those frames you made? Where did you get your chandelier from? I love it. Where did you get the name wall decal with the little bird? So cute! bought it from this lady on Etsy...But I don't see that she is offering it anymore. Maybe you can contact her? Where did you get the side table? Let me just start by saying how beautiful your nursery is. My daughter is expecting in Jan and we are using your nursery as our inspiration. I have a question about the table color. Is it the same as the wall color expect in a gloss? I love your nursery, and my daughter is using it as inspiration for her daughters nursery. I have a question about the table, did you use the wall color except in a gloss? Beautiful! What is the size of the picture above the crib? Thanks! I love the monogram letter. Have found lots of zinc and wooden monograms, but where did you get this one? Love the color, and want one with a sea foam green or aqua print. Heidi, where did you get the monogrammed letter? Have been able to find lots in zinc, nickel, or wood. But want to find one w. color. Thx! beautiful Heidi! Thank you for giving me inspiration! 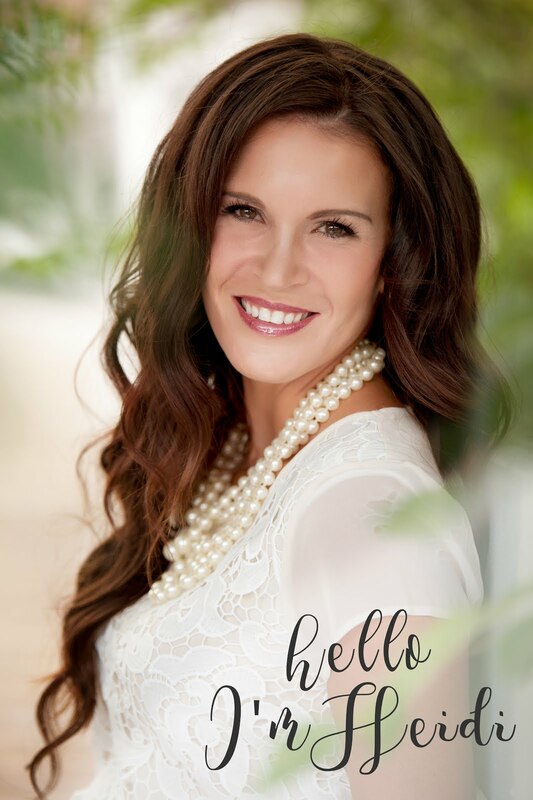 This is beautiful Heidi! Love the blue/purple combo. Thank you for the inspiration! I love the framed pictures...What size prints did you use in the frames? Hi!! What is the height of the wainscoting? Love your proportions! What is the height of the wainscoting? Love the proportions? What color did you pick for the name over her bed? Was it Violet? Is the Bri-wax just clear? Did you just rub over the paint with a brush? Did you use a clear briwax? How did you apply? 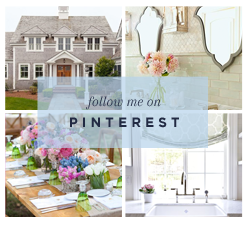 Love love love this gorgeous room! Did you use white white for the bottom of walls? Or is it an antique white? Hi! I love your nursery! 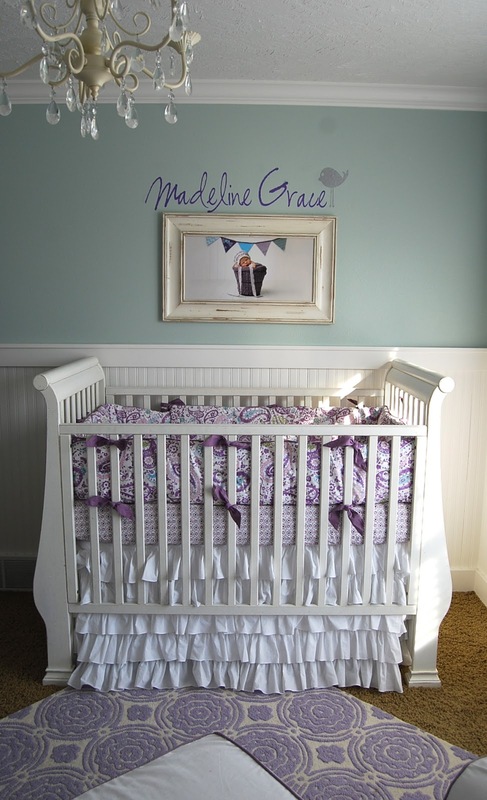 What is the name of the Etsy vendor that made your crib skirt? And what material is it made of? Thanks! Gorgeous! How tall is the wainescoting? And where did you purchase materials from?